Refer to this user guide for details on formatting the data input for ACAManager imports. Employee Demographics – The EE name should match that as with on file with the IRS. i. At least One Class needs to be set in ACAManager. If only one is created in ACAManager, leave blank or enter the Class ID from ACAManager for all employees. If you want to define custom lookback periods, identify each group as needed to create the desired lookback grouping. i. For Company's reporting under a single EIN the Division ID from ACAManager should be used instead. System requires at least one Division to be set. Employee Status - Use as many lines as necessary to accurately represent the Employee's history for the Tax Year. Employee Eligibility - If an employee is a new hire and not yet eligible for benefits, please mark YES for "In Waiting Period" and enter the dates the employee will become eligible. When an employee is in their waiting period MEC/MVS should be marked NO. Employee Enrollment - If there was a break in the employee's coverage, multiple lines can be used to reflect as much. Covered Dependents - This is required if the plans are Self-Insured. If the plans are Fully Insured, this tab does not need to be included. 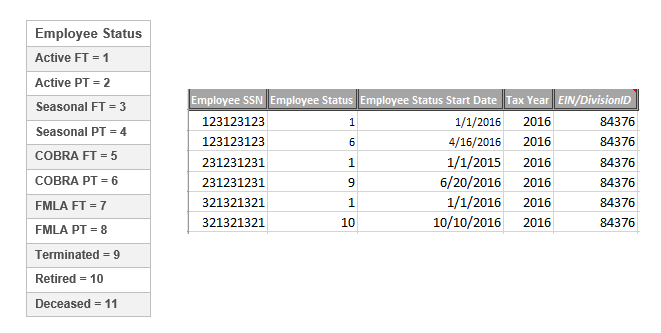 Employee Hours Tracking - This is only required if using the system to calculate FT/PT status using lookback periods.